A billboard in downtown Mason City is sparking conversations. 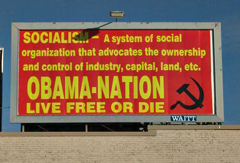 It features a definition of socialism, along with the phrase “Obama-Nation — Live Free or Die” and the Communist symbol of a hammer and sickle. Mark Tlusty of Rockford is spokesman for Concerned Citizens, the group that paid around $400 to display the sign for a month. Tlusty says the billboard idea stems from a “TEA Party” rally held in Mason City back in April. He says: “There was a bunch of us that got together and same thing, freedom of speech. We considered ourselves concerned citizens of America. We didn’t care if we were Democrat, Republican, conservatives or left. It didn’t matter. If you were deeply concerned in the way your country’s running, you should be involved in this.” Tlusty says many people have expressed displeasure with the billboard, but he says plenty of people like it, too. Tlusty says he’s had more response to the sign that he originally anticipated. He says for every one bad phone call, he’s getting about five to ten good ones, and he hopes people who are against the sign look more closely at what his group is doing. The billboard is located in the 600-block of South Federal, between the intersections of State Highway 122 and U.S. Highway 65.